A week ago, Sandy and I made a trip to the busy Class D Palwaukee Airport. The object of that lesson was to put me in a heavy workload situation where I had to stay ahead of the airplane to keep up. Yesterday’s lesson was more of the same but even more extreme. We flew from Waukegan to General Mitchell International Airport at Milwaukee. Milwaukee is a very busy Class C airport where general aviation mixes with the airlines. Before we took off, I wrote down all the frequencies I thought we would need. I also had airport and taxi diagrams handy. Sandy quizzed me about what we could expect in Class C airspace. I did the preflight, set up my radios and we were ready to go. The trip is not as simple as just taking off from Waukegan and flying north to Milwaukee. There would be a lot of coordination for me to do along the way. I called ground and told the controller we were ready to taxi for a VFR departure to the north. He cleared me to taxi to runway 23 where I called the tower for takeoff clearance. The same controller was working both ground and tower, as is usual on Sunday’s, and he cleared me to takeoff and turn on course. Three hundred feet below pattern altitude, I made my turn to the north. The controller came on and asked me what our route of flight would be. I told him we were headed north. I told him we were going north to Milwaukee. Sandy assured me that I had said north when I called ground. No big deal this time, no other aircraft were north of us at the time, but it is a reminder that it is important to keep scanning for traffic even while talking to tower. By now, we were getting close to Kenosha’s airspace so I asked for a frequency change and called the Kenosha tower to request a transition of their airspace enroute to Milwaukee. Permission was granted and we over flew the airport at 2800 feet. While this communication was going on, I was also leveling off, doing my cruise checklist and changing frequencies to have the next ones I would need available. I can repeat it now, but yesterday I only managed to read back part of it to the controller. He had to repeat the part about following runway 31 to the end then entering g the right downwind for 25 right. About the time I was starting my turn inbound, approach handed me off the tower. 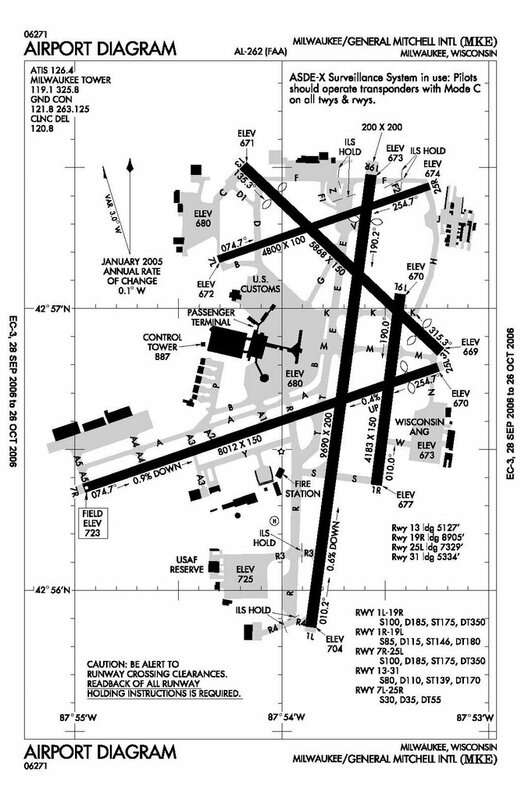 The tower controller reiterated the instruction to over fly the length of runway 31 then enter the downwind for 25R. I made the turn to downwind then had to lose a lot of altitude to get down to the traffic pattern altitude of 1700 feet. I also lost the runway in the low sun when I was on base. With Sandy‘s help, I found it again in time to turn final. The landing was pretty good but, with all that was going on; I didn’t really even analyze it. The tower had me turn right and contact ground. Sandy requested a taxi back and permission to stay in the pattern for one more landing. It was a long taxi back to 25R but only uinvolved two taxiways so it was fairly easy to find our way. On this trip around the pattern, I had the sun in my eyes on both the take off and landing but I was prepared for it and kept the runway in sight. It was another decent landing and we were passed off to ground again. This time we asked for a departure to the south and were sent to runway 19R. On the way there, the ground controller gave me a new squawk code and a departure frequency. Of course, she gave me those just as I was turning from taxiway D to F and I missed the numbers. I stopped on the taxiway, got a repeat and set the transponder and radio before continuing to taxi. I was next directed to hold short of taxiway E and monitor tower. A couple Midwest Airlines flights taxied down taxiway E and took off before I was directed to position and hold on runway 19R. Two more airliners and one small aircraft landed on the crossing runways and then I was cleared for takeoff. 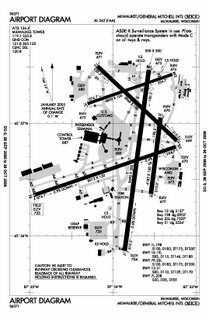 We rolled down the runway and were barely airborne when the controller directed me to turn to a heading of 200 and contact departure. I switched the radio over to the departure frequency and gave them a call. The controller came back and asked my destination. I told her we were going to Waukegan and she told us to maintain VFR. A few more minutes on heading 200 then she gave us a turn to 180. Departure kept us until we were south of Kenosha then turned us loose. A quick listen to the Waukegan ATIS and then I called Waukegan tower. It was good to hear that familiar voice and know we were back home. A decent landing on runway 23 and a short taxi to parking ended this adventure. I learned a lot from the trip. It is very important to be able to multitask while flying in busy airspace. I have to write down as much of the controllers instructions as I can and not hesitate to ask for repeats when I need them. Don’t let busy controllers distract me from flying the airplane first. Use the resources I have in the plane, including passengers. Having someone along who can tune radios, help listen for radio calls and watch for traffic can greatly reduce the pilot’s workload.